There are so many ways to add internet to your TV. But, all the devices helping out for adding internet to your TV sets are kind of big plastic boxes. But Google’s new Chromecast device is the cheapest, smallest and easiest way to add internet to your TV set. The size of the Chromecast device is exactly same as the size of a flash drive. It costs only $35, which very less as compared to Apple TV, Roku which are big plastic boxes which brings HDTV to your TV sets but costs $100. 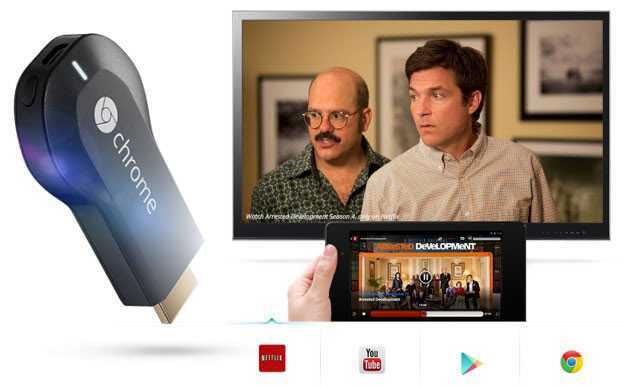 Chromecast is the easiest way to enjoy Internet TV, online video and music on your home TV. You can watch videos from YouTube, TV shows from Netflix and Google Play on your big screen home TV. The phone or tablet you are using with setup program will work as the remote control for Chromecast. You can pause, play and rewind the videos with your mobile or tablet. Apple TV, Roku, Plair like devices have their own remote control but for Chromecast you need to own a mobile/tablet with wi-fi. But using mobile as remote control has its own advantage, you can do other things in your hand held device while watching the internet videos on your TV set. Chromecast is more reliable because it works for all operating systems (iOS, Android, Windows). If we talk about service like Apple TV it only works on iOS devices. Chromecast is better device than other similar devices from the price ($35) point of view and from the size point of view (you can carry it inside your pocket). In comparison to other devices that helps us to use internet o TV, Chromecast shows more flexibility.